Introducing our newest book that HAS replaced our older one shown below. Using some of the illustrations from the original book, this book adds lots of photo examples of both good groupings and poor ones so you can really see what works and what doesn't. But even more important, you'll understand WHY certain arrangements are great and others not so great. This will help you avoid making the most typical and non-typical mistakes you see in homes (and even in fine decorating magazines and books). 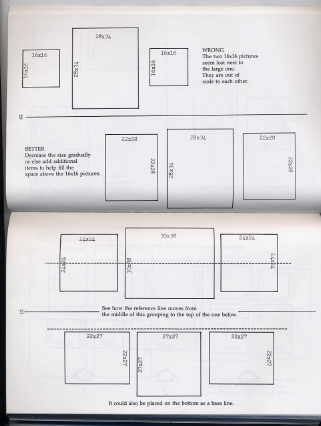 Wall Groupings! picks up where Where There's a Wall - There's a Way leaves off. While there are many more illustrations in the older version (making it ideal to own both copies), you'll find that either choice is an excellent one to learn how to arrange wall groupings in your home. When the first published book sells out, it will not be reprinted, so if you want both copies, be sure to order them both today. We are on our last box of the original book. For more details, read below. Includes the following: 1) Learning the Rules; 2) Illustrations of Groupings; 3) A Potpourri of Actual Wall Groupings; 4) Drawing Your Own Ideas; 5) Templates to Copy; 6) The Good, the Bad and the Ugly; 7) Additional Resources. NOTE: Order the above book as the older version below is now sold out. 101 Ways to Dress a Naked Wall - Sold Out - Sorry! Get 101 illustrated ideas on how to create beautiful wall groupings for your home or office in this one-of-a-kind specialty book titled, "Where There's a Wall -- There's a Way", which can only be purchased directly from the author, Barbara Jennings. Learn how to incorporate framed art, shelves, plants, mirrors and art objects into spectacular wall groupings. Discover the secrets designers use to make elaborate, breathtakingly unique groupings. From the simple to the very complex, this book will take the fear out of the most complex ideas. Find out how to hang art quickly and easily. 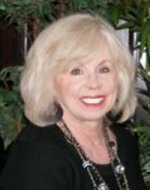 "Barbara, your input has allowed me to confirm several concerns and put others to rest. Now, I can enjoy and feel more comfortable with my decorating venture...at least, I know I'm moving in the right direction. I'm took particular notice to your warning that "the eye needs a place to rest". . . . I am ever so grateful to you for your guidance; sharing your personal expertise and your timely response to my questions...very helpful and deeply appreciated . Thank you very much. . . . Dotti Lu"
Learn how to take a wide variety of things, like you see in the pictures below, and arrange them in a more effective and attractive manner. It's easy when you know how. Create elaborate groupings like this. Learn about focal points, balance, unity, variety, scale, proportion, line, geometric shapes and so forth. Use the easily reproducible templates at the back of the book to plan your own groupings on paper before you commit to anything. 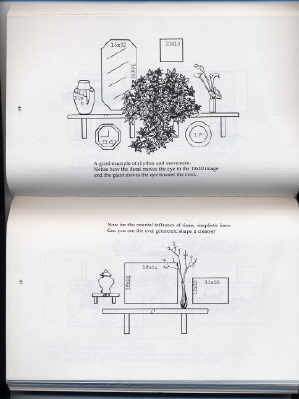 The book, while first published in 1986, discusses all of the important concepts that go into arranging multiple pieces together, whether it be art, pictures, shelves, plants, lamps, furniture and accessories. The design concepts never change, though styles do and fads come and go. The design concepts, however, are forever. So the reasoning behind the arrangements of yesterday, today and tomorrow will always remain. Only the colors and styles of individual items changes. I currently have tons of magazines in my office depicting all kinds of wall groupings that professional designers have created in the last 3 months alone. Each arrangement could have easily been lifted right out of this book, because the design concepts don't change. They will be as relevant 50 years from today as they are now or were 20 years ago. As a free bonus, you'll also receive a recent wallgrouping report that is filled with picture after picture of current wall groupings of today. You'll be amazed at the variety. These groupings may be just art on a wall, or they may be art combined with furniture, or they may be collector plates or a combination of many different elements, all neatly and expertly arranged by professionals. Hopefully they will trigger your own creativity to kick into gear and help you create breathtaking arrangements of your own, using the art and accessories and furniture you already own. Read the review by Decor Magazine below (picture is from American Baby Magazine article interview with Barbara Jennings, February, 2005) for more information and their endorsement of the book. This book has been used by several interior design departments at major universities as a textbook. "For any framer, designer or homemaker who ever wanted to arrange pictures pleasingly on the wall, Barbara Jennings' breezy little manual makes light and interesting reading. The approach is simple but sensible, the text is brief but sufficient, and the illustrations are easy to understand. "Jennings takes as her premise in hanging art that more is usually better as long as the rules are followed. She opens the book by explaining balance, proportion, and scale (larger pieces should "support" smaller pieces, darker pieces should support lighter ones, and the whole arrangement should form a certain shape or follow a definite line). Any artist is probably familiar with her rules of design, but they make sense in the context of wall groupings as well, if you consider the empty wall a single blank canvas to be decorated. "Jennings incorporates mirrors, plants, shelves, pottery, clocks and objects d'art in her wall groupings, with short explanations of how each fits into the overall scheme of the design. 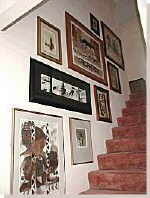 She also touches briefly on such topics as groupings over stairwells and how to place diptychs and triptychs on a wall. Much of the information comes in one-line captions accompanying the 101 sketches of possible wall groupings. She does not go into great detail about any of these arrangements, but the illustrations serve pretty well to explain themselves. This book would be particularly helpful to framers or dealers who work on large art installations for corporations or residences. But it also could be useful to retailers interested in spicing up their own in-store displays with well-done wall groupings. 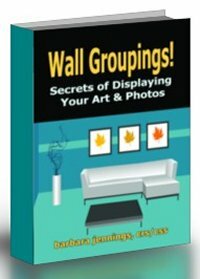 -- Reviewed by Sharon Shinn"
Wall Groupings! is a one-of-a-kind book on the subject of wall grouping design. You won't find another one like it anywhere for any price. That's why it's such a bargain at this site. BONUS #1: As an added bonus, you will receive a special email address given only to our readers so that you can ask personalized decorating questions and receive a personal response by Barbara Jennings, usually the same day. This is one author who really wants to help you apply the concepts and techniques to your own situation. This valuable personalized service is FREE, but just to our readers. So order your copy today. It's like having your personal decorator/mentor available 7 days a week. You won't find that offered anywhere else! BONUS #2: You'll also get access to my brand new special report of 36+ photos that shows you many different kinds of wall groupings, plus other types of groupings that will make your home far more interesting and create great conversational areas. I've included notations and comments about each photo to help you further understand the creative, yet sometimes complex, subject of designing groupings. It's an exclusive group of images that you won't find anywhere else and I'm including it as a free bonus. By studying the concepts laid out in the book and looking at current groupings using these same concepts, you'll see why this book is so timeless, regardless of style or fads that come and go. "Dear Barbara, I just received your 'Where There's a Wall - There's a Way' book and I also have your 'Decor Secrets Revealed' eBook and love them both. They have a lot of great suggestions and will be very helpful. - Millie Schara"